This major exhibition explores a short, yet significant, period in the life of one of Britain’s most celebrated artists, and highlights Hepworth’s little-known connection to Hertfordshire. Barbara Hepworth (1903 - 1975) was a British sculptor and leading figure in the international art scene, in a remarkable career spanning five decades. Bringing together sculptures and drawings, some of which have not been seen together since they were first created 70 years ago, this unique exhibitionfocuses on an important period in Hepworth’s career immediately after the Second World War, when she was working from her new studio in St Ives and began to receive wide recognition. 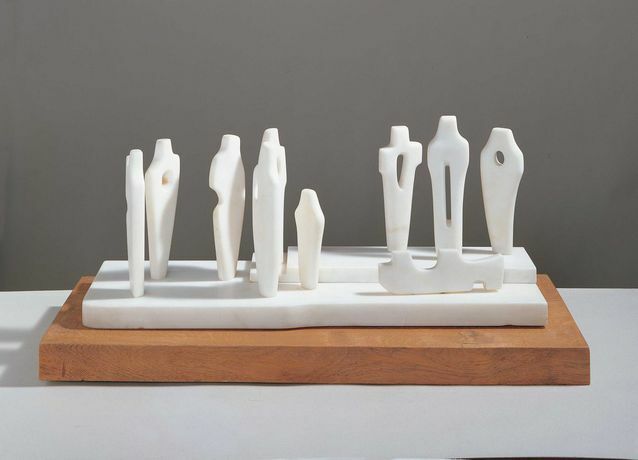 Between 1948 and 1953, a connection between Hepworth and Hertfordshire was also formed through a number of sculptural purchases and commissions. Two major sculptures commissioned for the Festival of Britain, Turning Forms and Contrapuntal Forms, were formally relocated to the area when the festival ended. A more intimate piece Eocene was acquired by Hertfordshire Schools Collection (currently displayed at St Albans Girls’ School) and in 1951 Hepworth was commissioned to carve Vertical Forms for Hatfield Technical College (now the University of Hertfordshire). Barbara Hepworth: Artist in Society 1948-53 showcases 20 drawings and sculptures and a collection of over 100 archival items to shine a light on her artistic practice during these pivotal years. It was a time when she returned to the human figure after a decade preoccupied with landscape; she drew dancers from life in the studio and she gained privileged access into operating theatres resulting in the remarkable ‘hospital drawings’. Her work is characterised by a fascination with female/male dualities, where abstracted male and female figures are placed in close relation to each other to form a single harmonious unit. Hepworth moved between and abstraction and figuration very naturally at the time, and seamlessly across the media of drawing and sculpture.